For years my entire family has been fascinated with all things Harry Potter related. My children have all read the books and seen every movie – more than once. And they have played games, built LEGOs, and have long wanted to visit Universal Orlando Resort’s Wizarding World of Harry Potter. So when my son picked his 13th Birthday Trip (We give our kids a trip for their 13th), it was no surprise that he wanted to visit both Hogsmeade and Diagon Alley at Universal Orlando Resort in Orlando, Florida. Opened in 2010 at Universal’s Island of Adventure, The Wizarding World of Harry Potter: Hogsmeade takes guests to the quaint town of Hogsmeade and the nearby Hogwarts School of Witchcraft and Wizardry. Hogsmeade features the one-of-a-kind coaster, Harry Potter & the Forbidden Journey, as well as The Flight of the Hippogriff and the Dragons Challenge. Catch the Hogwarts Express to ride over to Diagon Alley. You must have tickets to both parks to be able to ride the train, as you are leaving Islands of Adventure and moving over to Universal Studios Florida. Diagon Alley is home to Harry Potter: Escape from Gringotts, a roller coaster ride, as well as several fun shops and restaurants. Both Hogsmeade and Diagon Alley are done so very well, as if you are walking right into the movie. Stay on Universal Property in one of their hotels (we love the Hard Rock Hotel Orlando!) and gain early admission to Hogsmeade at Islands of Adventure or Diagon Alley at Universal Orlando Resort (alternates) from 8am – 9am. You can use this first hour to see much of Wizarding World of Harry Potter with out the crowds before the rest of the park opens. If in Hogsmeade, head to Hogwarts first and ride Harry Potter & the Forbidden Journey as this is one of the most popular rides in the park and there is no Express Pass line so the waits can typically be 45-60 minutes. Try to ride this one first to avoid a long wait. That said, take your time walking through the castle (it’s the queue) as there are so many great secrets here. If in Diagon Alley, go first to Escape from Gringotts – the same wait can be experienced here once the park opens to the general public. We found the wait time for both of the coasters to be very small. And with the Early Admission Hour, we were able to ride both of them in the front row – what a rush! Did you even know there are 4 ways to try this famous drink? The hot version is like a warm butterscotch cream (think hot chocolate but butterscotch-flavored). The cold is a fizzy butterscotch creme soda. The frozen is a butterscotchy-icee. And the soft serve ice cream is what else? Butterscotchy. I love the flavor of butterscotch, so between the 2 of us, we had 7 different Butterbeers. My favorite was the cold, my son loved the ice cream. Each to their own, but you have to try them all! You can’t come to the Wizarding World of Harry Potter and not get one of the best keepsakes – a wand. And it is quite the experience to witness a wand-selection at Ollivanders. If you are lucky, you may be chosen to actually have the “wand choose you” during the ceremony. Upgrade that wand for $10 more and walk around Hogsmeade & Diagon Alley making all the windows come to life. An interactive wand comes with a map of all the places you can cast spells. Or look for the golden discs on the ground for the spell instructions. It’s not as easy as it looks and takes a bit of concentration. The interactive wand is $50 but it was really fun to see all the windows come to life. Dress Up – this is Harry Potter after all! You will find everything you need to dress the part of a Hogwarts student or Witch or Wizard at the parks, from t-shirts to capes. But we found people fully dressed in Hogwarts sweaters, ties, and long socks – it was great! And don’t miss going thru Platform 9 3/4! Most of the day, the line for Escape from Gringotts hovered around 60 minutes. I do recommend that you wait in the line to get the full experience of the goblins in the lobby and the story of the escape, however if you want to ride it again, jump in the single rider line. We did it twice and it took us 10 mins to get on. And we both ended up in the same car but different rows each time. Experience a true British meal at either the Leaky Caldron (Diagon Alley) or Three Broomsticks (Hogsmeade). The atmosphere is fantastic and even the servers act the part by making the food “magically appear at you table.” We tried the cottage pie & pumpkin juice and it was very tasty. Though I preferred Butterbeer over the pumpkin juice any day….. Remember the moving pictures on the newspapers and the walls in the movies? You can make your own versions at Shutterbutton’s in Diagon Alley. It’s only only $16.95 for a DVD and sharable link and they provide you with clothing and props. When the Dragon begins to rumble, be ready for the heat! Make sure to see the dragon breathing out his fire from all different angles. And get a selfie with him for goodness sake! 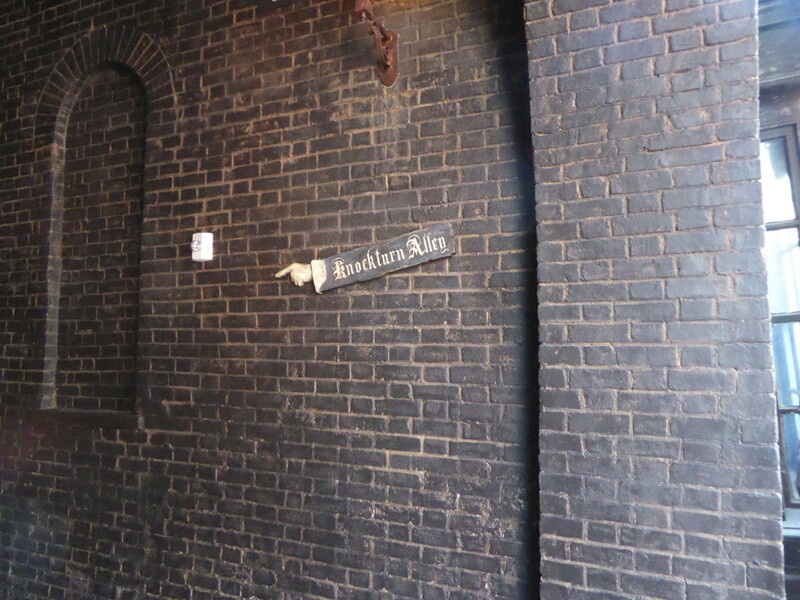 Take a wrong turn down Knockturn Alley and create some scary spells and check out the crazy findings in Borgin & Burkes. 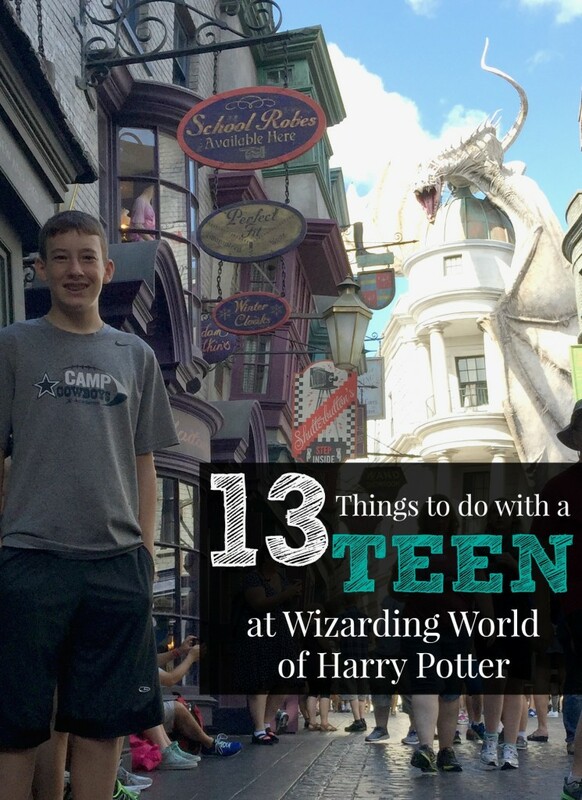 There are really lots of fun things to do at both Hogsmeade and Diagon Alley, but these are the 13 that my 13 year old and I enjoyed the best. Again, both parks are fantastic and it is so neat to have a place that created such a fantastical world – one that originated in our imaginations when we read the books and amazed us in the movies. If you have Harry Potter fans in your house, Universal Studios Resort in Orlando, FL is a must see. Disclosure: My family & I were invited to visit Universal Orlando Resort and were provided with one day media passes. I was not compensated for this article. All opinions are my own.